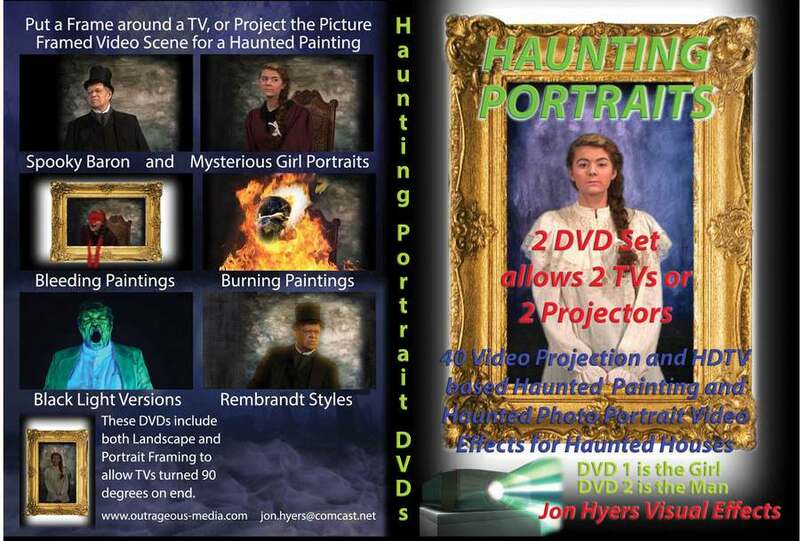 Ready-to-Use Special Effects on DVD for Video Projection Illusions to use for Haunted House, and Halloween Home decorating, Haunting Portraits DVD set contains two DVDs, one with a male portrait, and another DVD with a female portrait. Each DVD has more than 35 varied effects, such as talking, looking around, morphing into skulls, burning, and bleeding. Contains full screen video and video with portrait frames. In some variations the Portraits transform into ghostly paintings and float out of the frame. Variations include versions that can be displayed on your TV to which you have added an actual picture frame, and video projectable versions with frames as part of the video effect. Great variety of uses, AND you get two DVDs. A simple and effective Halloween decoration!